In a very rare occurrence all four players tied for first place in today’s top quad. Michael Amori, Joe Bihlmeyer, Andrew Dexter and Ismael Pagan shared first with 1.5/3 each. 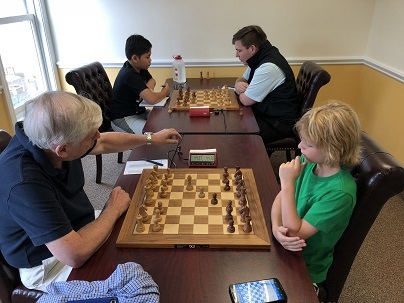 Bihlmeyer was the only undefeated player while the others traded victories. Larry Price was the deserving winner in quad two with 2.5/3 to finish in clear first. 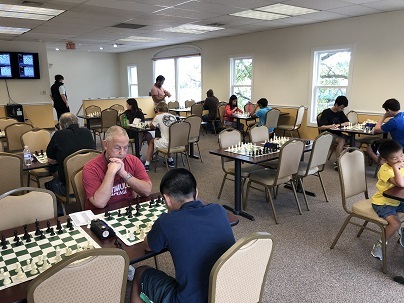 William Ewald and Yikuan Zhou also finished with 2.5/3 to win quads three and four respectively. The final section of the day was a six player swiss. Fifth seeded Connor Wang gave up only a single draw to with 2.5/3. Aaron Kuo finished just behind with 2/3 for clear second place. Thank you to all of our participants! We look forward to seeing you again next weekend.